It’s the second semi-final and almost unthinkably England are only 90 minutes away from the final. Every time you turn on the TV there are constant references to ‘It’s coming home’ etc and there is a tangible sense of belief and even destiny amongst the English media and fans alike. I try and round up people to go out with to watch it in the pub but everyone is too afraid that they might actually win and I’m declined by various parties. So it’s off to my dads to take it in with him and my brother in law instead. After five minutes Kieran Trippier curls a pretty wonderful free-kick up and over the Croatian wall and the English are ahead. The silence in the room is deafening. Pictures from outdoor – and indoor as well come to think of it – arenas show lager raining down on the hordes of English fans as beers are gleefully thrown up in the air. This seems to have become a theme of English fans celebration throughout the tournament. I mean once the celebrations die down it must be pretty gutting to realise you waited in a massive queue to buy a few beers for a more than likely scandalous price only for you to subsequently hurl them into the air five minutes after kick off. Later in the half Harry Kane is through one on one with the Croat keeper to block and then Kane has a second go which deflects of the keeper and then the post before going out. The linesman flags thereafter though no one is sure what for. A wonderful chance missed and you get the feeling that it may come back to haunt Harry. In fairness, England are the better team in the first half and the Croatians look somewhat sheepish most likely as a result of the exhaustion they are suffering due to having to go through extra-time and penalties in their last two games. The tide changes in the second half and seeing the finishing line in the distance England appear to sit in and Croatia take over. They get their just rewards when Ivan Perisic flicks out his boot to poke in Croatia’s equaliser on 68 minutes. Martin Keown tries to suggest a high boot but not even he believes there is anything in it and England are on the back foot big time now, holding on for dear life. They make it to extra time and appear to have settled for penalties, their belief obviously up having won a shootout finally against Colombia in the last 16. 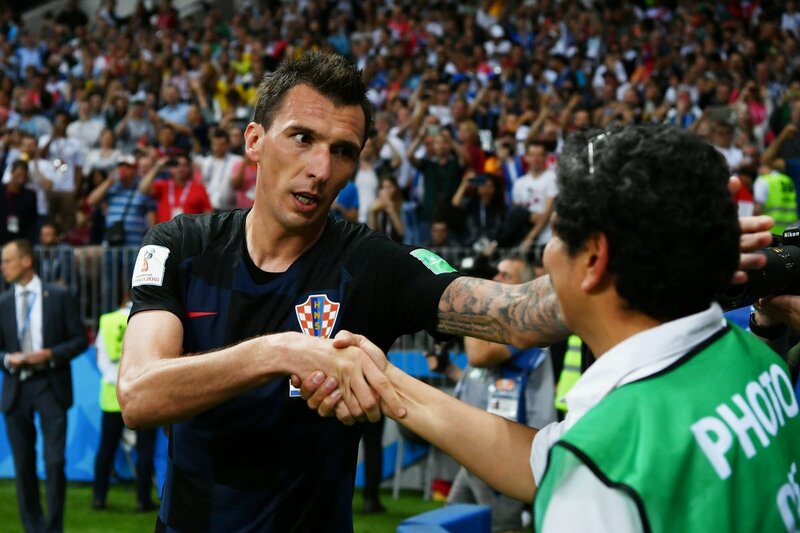 However, Mario Mandzukic has other ideas and he beats the offside trap to put the Croats ahead deep into extra time and in the subsequent celebrations the entire Croat squad pile onto an unsuspecting cameraman. We’re all banging our fists off the ceiling. Amazing how Scottish football fans care more about England losing than Scotland winning. Probably because Scotland doesn’t win that much. Not when it matters anyway. Usually, the English never let you down in that respect either but they’ve been doing the opposite thus far in this tournament. There’s no way back for England now as they are dead on their feet and the referee signals the match over as well as England’s pursuit of a first World Cup in over half a century. Just like that, it’s like a ball is deflated all over the southern part of Britain along with a collected sigh in Wales, Scotland and Ireland. The noise sounds eerily similar. Anyway, that’s tiny little Croatia, a country of only 4.2 million incredibly in the final. It’s amazing how many excellent footballers such a small nation has churned out over the past 20-25 years.